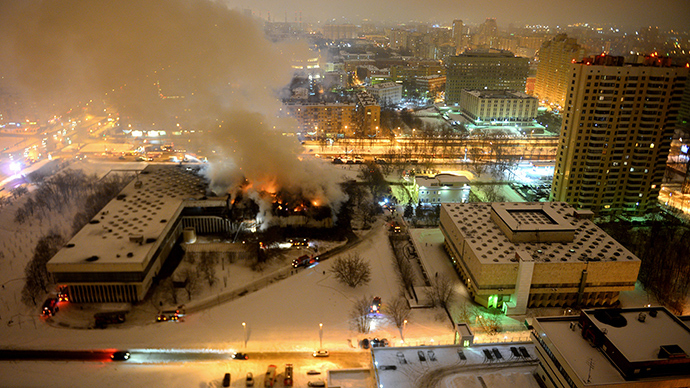 The massive fire in Russia’s leading academic library may have destroyed some 15 percent of the collection – or roughly two million unique, historic documents. The devastation “resembles Chernobyl,” say academics hoping to save some of the ancient texts. 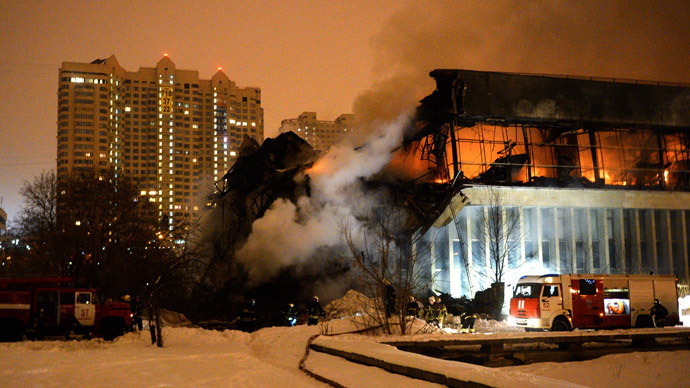 The blaze – which erupted at around 10 p.m. Moscow time on Friday (7 p.m. GMT), on the third floor of the Academic Institute of Scientific Information on Social Sciences (INION) in Moscow – was fully extinguished at 11:24 p.m. on Saturday, according to the Emergencies Ministry. Firefighters will continue to pour water over some 2,000 square meters of the damaged building until Sunday morning. The smoking debris of the library “resembles Chernobyl,” said the head of the Russian Academy of Sciences (RAS), Vladimir Fortov, after he inspected the scene on Nakhimovsky Prospect along with INION director Yury Pivovarov. “This is a great loss for science. It is the world’s largest depository of this kind, similar, probably, to the Library of Congress. Here we have the materials which cannot be found elsewhere, and all humanitarian institutions used this library,” Fortov said, as quoted by TASS. Earlier, the head of RAS estimated that the fire might have affected 15 percent of the library collection, or roughly two million books and texts. The director of INION called the incident a“tragedy,”as only a small part of the material had digital copies. Luckily, most of the books are stored in the basement and on the first floor of the building – and since the fire started on the third floor, firefighters managed to contain it before the blaze reached the storerooms. Many of the texts were still damaged by the water, but Pivovarov says there is a good chance they can be saved. “After the water damage, thanks to modern technology, it is possible to save the books. But after the fire...We cannot turn ashes back into paper,” said the academician. Pivovarov added that the international scientific community has already voiced its desire to help. “The library will need more than just a restoration, it needs complete reconstruction,”he said, noting that he hopes the government will aid in the effort to save books and rebuild the library, which he estimates will take years. The press secretary of the Federal Agency of Scientific Organizations, Maria Dokuchaeva, told Interfax that once the area is cleared, INION management will examine the full extent of the damage caused by the massive fire and the efforts to contain it. The investigation into the cause of the fire is still underway, but arson or closed circuit fire are the main theories the probe is considering. “A short circuit in the electrical system is currently being regarded as a primary lead,” a law enforcement source told Sputnik on Saturday. The last inspection of the INION library in March found seven violations, according to the Moscow branch of the Emergencies Ministry. The library was fined 70,000 rubles (US$2,200) and given until January 30, 2015 to fix the violations. The fire ironically erupted exactly on that deadline. With 49,000 readers and 330 employees, INION is the largest research center in Russia in the fields of social sciences and humanities. Its collection consists of 14.2 million texts in both ancient and modern European and Asian languages, including rare 400-year-old editions. It also has one of the biggest collections of Slavic language books in the country. The library, founded in 1918, also boasts Russia's most complete collection of documents of the League of Nations, the UN, and UNESCO, as well as parliamentarian reports of the United States (since 1789), the UK (since 1803), Italy (since 1897), and many others.